Rome Cavalieri has been attracting international celebrities and jetsetters for more than 50 years now. Set on a hilltop surrounded by a 15-acre private park, the property overlooks Rome and Vatican City. Each of the 345 rooms have their own private balcony, which is nothing compared to the Suites, some which have their own terraces and hot tubs. The hotel itself is an art museum, with countless treasures. And you'll also find what is considered the best restaurant and best spa in Rome here. This hotel is still popular with celebrities today who are looking for a full-service resort. Serena Williams recently met her husband here. Rooms are royally decorated in navy carpet and gold bedding, walls and wallpaper with marble antique desks and chairs. Each room boasts its own balcony. Huge feather beds make you feel like you're floating, and there's a pillow menu if you don't like the already fluffy assortment. Suites have their own rare works of art from 18th century antiques to paintings by Andy Warhol or Robert Indiana, or incredibly, jumbo-sized orange velvet sofa set previously owned by Karl Lagerfeld. Guests in certain high-tier rooms have access to the Imperial Club Lounge, which offers snacks and beverages gratis throughout the day. Bathrooms are huge, done in floor to ceiling marble, with giant mirrors and a star floor mosaic. Fresh towels and toiletries from Salvatore Ferragamo are replenished throughout the day. There's also a soap menu if for some reason you don't have enough. The lobby itself is an art museum, worth visiting just to see three of Italian painter Giovanni Battista Tiepolo's masterpieces covering the walls. It's full of priceless paintings, tapestries and antique furniture. There's a huge seating area under the domed ceilings as well as a variety of upscale boutiques tucked away. There are a variety of front desk staff and concierge lining two walls to help you plan any portion of your trip. 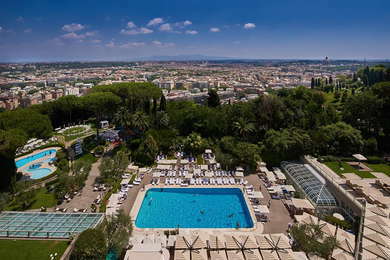 You'll also find the best pool in Rome here, a huge outdoor club where the city's elite come to buy day passes in the summer to escape the heat on one of the plush sunbeds. There are three outdoor pools in total, one a children's pool, as well as a glass-domed indoor pool with a fireplace backdrop. The spa is easily the best in Rome, with its huge amethyst Turkish bath, whirlpool and two saunas. The Japanese stone-walk alternates hot and cold water to refresh tired legs. There's a wide assortment of facials using La Prairie products as well as a full menu of body treatments including the four hands massage. The relaxation room is decorated like an emperor's palace, so you can relax all day on huge white lounges. The huge gym has top-of-the-line Technogym equipment, and there's a full range of workout classes offered for extra motivation. Also outdoors you'll find two Davis Cup red clay tennis courts and a fitness trail to explore the hotel grounds. La Pergola is Rome's only three Michelin-starred restaurant. Chef Heinz Beck continuously reinvents classical dishes for guests dining on the rooftop terrace that has a panoramic view of the city. The restaurant itself is filled with 18th century bronze candelabra, a rare Aubusson tapestry, and hand-blown glassware from Art Nouveau king Emile Galle. Next to La Pergola is the equally over-the-top cigar lounge. The menu includes wine dating back to 1888. If you want to spend time enjoying the lobby art, the Tiepolo Lounge and Terrace serves drinks and casual food throughout the day. There's also live entertainment every night. At the Grand Spa Cafe you can sample a variety of herbal teas or freshly-squeezed juices. Drinks and ice cream are also served at the Pool Bar throughout the summer. The hotel is not the most central for walking around, but there's a free hourly shuttle to take guests into and out of Piazza Barberini for easy access to sightseeing. The Cipro metro is a 20-minute walk away, and the Vatican Museums are a 25-minute walk away. Fiumicino Airport is a 35-minute drive away. Bibi e Romeo (4-minute drive) features home-cooked Roman classics at affordable prices. Simple dishes like rigatoni alla gricia or stuffed anchovies are incredible. La Soffitta Renovatio (8-minute drive) is a dream for celiacs. Almost the entire menu from pizza to pasta to desserts can all be made gluten free. McQueen (9-minute drive) is a cozy pub dedicated to the American actor. There's an outdoor covered terrace to enjoy any number of their great microbrews. Fonclea (10-minute drive) is a fun British pub with lots of beers on tap and live jazz or rock music. It's great for a casual night out after dinner. This is one of the few true full-service resorts in Rome, which makes it immensely popular with American tourists. Service is truly five-star and expect to pay for what you're getting. It's worth visiting just to see the incredible artwork throughout the hotel, or to to use the pool for a day. While not the most central location for sightseeing in the center, everything is easily accessible. Hotel staff will help you put together the perfect itinerary. And at night you can return to this private oasis and enjoy the view of Rome at night from your balcony.